Irene & Mr.Sheep Knitting Shop's Classic News Archive. "Once upon a time, deep in a Norwegian forest, a man named Torgeir Berge and his dog Tinni came across a wild animal that would change their lives forever: a fox Berge named Sniffer that grew to be" Tinni's Best Friend » A full story "Dog and fox form a friendship fit for fables" is © CottageLife.com. August 2010 eUpdate, Yarn Market News: "With so many knitters and crocheters figuratively charting their own design course these days, Adriana Hernandez has made it easier for them to do so literally. Hernandez is the designer of StitchinKnit and StitchinCrochet - fonts that translate knit and crochet symbols to your computer keyboard." ENLARGE © BBC News The mighty bunny weighs a massive 7.7kg, and his ears are a lengthy 21cm - almost as long as most pet rabbits are tall. And he is almost 1m tall. The German Giant is even big for his breed, which usually tip the scales at around 6kg. Herman lives in a specially built solid oak hutch and chomps his way through just over 2kg of food a day. His owner says his favourite snack is lettuce. The giant bunny also takes a vitamin supplement to keep him healthy, and munches through a bale of hay a week. 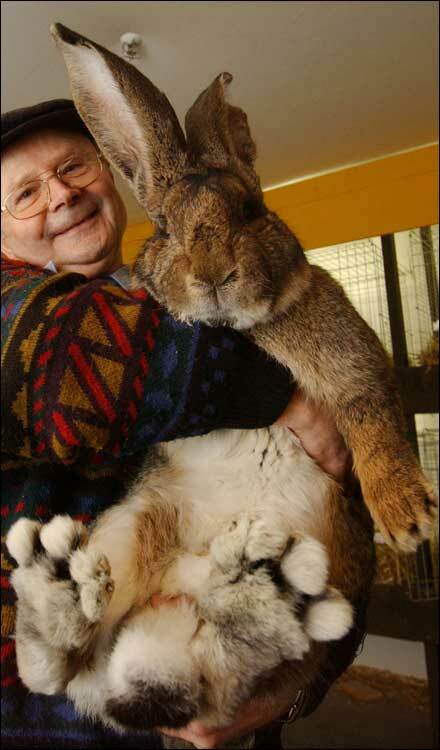 Herman could be the world's biggest rabbit, but Guinness World Records have stopped accepting entries because of fears people were over-feeding their pets. German Giants do not exist in the wild, and have been developed by breeders. The can live for as long as 12 years. Photography and story © RoadSideAmerica.com The World's Largest Ball of Twine story began in 1953, when farmer Frank Stoeber, like thousands of his rural brethren, found it tidy and efficient to roll spare bits of sisal twine into a small ball in his barn. But over the years, instead of re-using or disposing of the twine, Frank kept rolling. By 1957, his twine ball weighed 2 1/2 tons and stood 8-ft. tall. By 1961, when he turned it over to the town, Stoeber had over 1,600,000 feet of twine rolled into a sphere 11 feet in diameter. Cawker City faced a dilemma. They wanted to preserve Stoeber's accomplishment as a single-minded Dreamer, as a few states away in Darwin, Minnesota, Francis A. Johnson had been also rolling his own twine since 1950. So the town took action. They picked up where Stoeber left off and continued to roll sisal twine, and organized an annual Twine-A-Thon, where anyone can step up and wrap more scrap twine onto the ball. In 1988, it outgrew its old gazebo and was moved to a more expansive roofed area. After 2003's Twine-A-Thon, total twine length was recorded as 7,049,191 feet.